There are several types of bridges. You and Dr. Sudati will discuss the best options for your particular case. 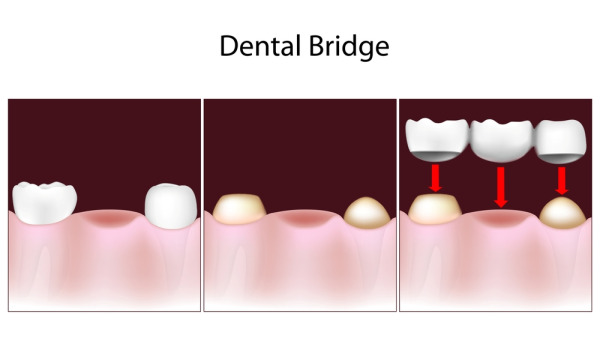 The “traditional bridge” is the most popular type and is usually made of porcelain fused to metal. This is an older dental treatment and is quickly being replaced by all ceramic Zirconia bridges, which are not only strong, but more natural looking and do not contain any metal. 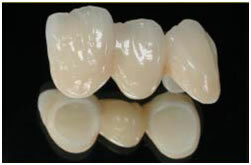 This photograph shows the difference between a single unit crown, which is permanently cemented on one tooth, as opposed to a permanent bridge, which is cemented on multiple teeth in order to fill in the space left from a missing tooth. The size of the bridge and the number of teeth involved will be proportional to the size of the edentulous (empty) space left from missing teeth. 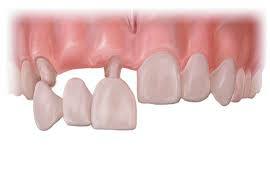 The more missing teeth, the more abutment (anchoring) teeth that will need to be prepared to help support the bridge.